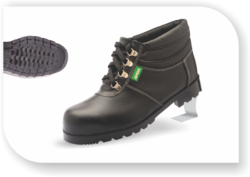 With our rich industry experience, we are engaged in offering exclusive ISI marked range of Heat and Oil Resistant Safety Shoes. Our offered shoes are high in demand in the market and are extensively used in Steel, Foundry, Engineering, Chemical, Construction, Food and Beverages Industries for their excellent resistance to heat, oil, acid, alkalies and abrasion, extremely durable and lightweight. Moreover, with the aim to add more clients with us, we are offering this range of shoes in various size, designs and custom-build models. High Ankle Heat resistant Safety shoes with Direct Valcunizing process, blended Nitrile Rubber Sole with IS:5676 marked and full shoes IS:15298:2016 ( Part-2) Marked. · SOLE – Direct vulcanizing Process blended Nitrile rubber sole( Black/Green) with IS:5676 marked , Heat resistant 300◦C for 1 minute, Acid alkalis, chemical resistant, antiskid & antipentration properties. · SOLE TEMPERATURE RESISTANCE – Max 300°C for 1 minute. · LINING- Breathable Camarilla lining with Antimicrobial treatment for odor control and 3mm foam lamination for extra comfort. · TOE CAP – Provided with 200J impact & compression resistance. · SOCK- EVA Socks with sweat absorbent properties. Packaging Details: ONE PAIR SHOULD BE PACK IN INDIVIDUAL BAG & BOX, MASTER CARTOON SHOULD BE PACK 10 PAIRS. 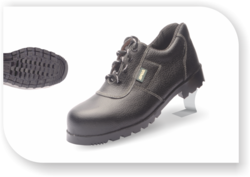 Because of our vast experience, we have been successful in catering to the requirements of our esteemed clients by offering a qualitative range of High Ankle Light Weight Safety Shoes .To serve our esteemed clients with a quality-approved range of products, we design and stitch these shoes as par the industry set quality parameters. We are offering this range in various sizes, color and design, with the aim to cope up with the distinctive requirements of our valued patrons. 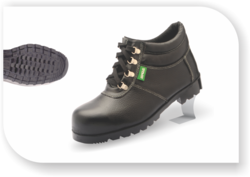 We are the manufacturer and exporter of Heat Resistant Safety Shoes which is manufactured by highly skilled person under the specific circumstances.Low ankle safety shoes with nitrile rubber sole having antistatic,antiskid, oil ,chemical and heat resistant properties. Lining :Cambrilla and non woven fabrics. Upper- Barton Print Buff Full grain Leather . The upper leather conforms to the requirements of standard no. IS: 15298 (Part-2)/2011 or ISO 20345 – 2004 for tensile strength, tear Strength Flexing resistance. Requirements of standard no. IS: 15298 (Part-2)/ 2011 or ISO 20345 – 2004 for abrasion resistance and tear resistance. of standard no. IS: 15298 (Part-2)/2011 or ISO 20345-2004 for impact and compression resistance.